Shakesville is pointing out that in the People cover story on Michelle Obama, she's called Barack's "helpmate" no less than four times. Just one month on the job, the First Lady takes a break to talk to PEOPLE about loving her family's new life in the White House, her juggling act as mom-in-chief and helpmate to leader of the free world-and, yes, when we'll get to meet the First Puppy. The most obvious word to use would be partner, which I'm guessing was not used for the very reason I like the word-its implicit suggestion of equality. If Barack is elected, Michelle insists, she has no interest in a role beyond that of helpmate and mother. She's a down-to-earth woman with consummate self-confidence and excellent judgment, complete integrity, and capable of keeping her kids grounded while being a helpmate and adviser to her husband ... 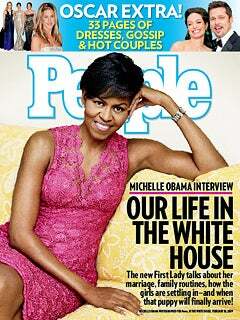 I think Michelle is going to make history as first lady. ... She will keep it real. In the same article, Ann Stock, White House social secretary under President Clinton says, "The first lady has always been a helpmate and sounding board for the president, his most trusted adviser, and that's always a given." It's likely the use of the word has more to do with Hillary Clinton than Michelle Obama. While it's true that "partner" seems like a more modern term for your spouse, Michelle sanctioning the frequent use of "helpmate" probably has less to do with her not being considered her husband's equal, and more to do with reassuring the American people that Barack's "partner" isn't going to be overhauling the health care system anytime soon.